This is a great little dish and quick and easy to prepare, as the stuffing is not cooked, merely heated through and is more like a warm salad than a hot filling. 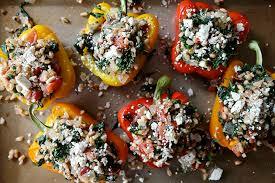 Roasting the peppers gives them a unique flavour and their natural sweetness combines perfectly with the tangy wheat salad. Put the bulghur wheat in a bowl, cover with boiling water and let stand for 30 minutes, until the grains are puffed and swollen. Drain, if necessary. Cut the peppers in half lengthways and scrape out and discard the seeds and membranes. Leave the stalk, which will help hold the peppers in shape. Put the remaining ingredients n a bowl, add the soaked bulghur wheat, season with salt and pepper and mix well. Pile the stuffing into the pepper halves. Cook on a stove-top grill pan until the peppers are tender and blackened underneath and the stuffing is warmed through. Serve with a crisp, green salad and warned pita bread.